Jessica is a Freelance Makeup Artist from Los Angeles CA. Before assuming her role as a makeup artist her goal was to become a fashion stylist, but soon identified that makeup was where her heart and passion was. She pursued this passion to develop her skill by making up the faces of friends and family and eventually receiving her certification as a professional makeup artist. From then on she drove head first into exploring all the different areas the world of makeup artistry can take her. Her creative style is what led her the opportunity to work with many different people on many projects. Focusing now mostly on weddings. Her passion and love for the art of makeup and her constant drive to continually learn her craft is what makes her unique as a makeup artist. Get more for your wedding! 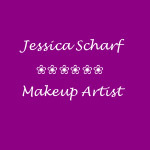 Don't forget to mention ChossonKallah.com when visiting Jessica Scharf Make Up Artist.